Mindful Mothers: Food Bank Donations: What Should I bring? Food Bank Donations: What Should I bring? The simple answer: what ever you can! The long answer: while bringing a non-perishable food item is always appreciated, the food bank has considerable buying power with their suppliers, so they are able to turn $1 into 10 pounds of food when they buy it themselves. But, donating food is still a great way to support the Food Bank Coalition. When families and organizations contribute fresh and non-perishable food, it puts more variety on the shelves and in the freezers. Here are some suggestions for nonperishable items to help provide a well-balanced, nutritious set of foods to those who do not have enough to eat. Canned or dry fruits and vegetables in an array of colors will help ensure consumption of many vitamins and minerals. Whole grains provide maximum nutrition value and long-lasting energy. Lean meats and canned or dry beans provide the necessary fuel for muscles. They especially enjoy the abundance of fresh fruit and vegetables grown in San Luis Obispo County. The Food Bank is committed to providing healthy, nutritious food to the community. 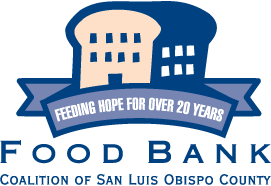 Click here for more info about why Mindful Mothers supports the Food Bank, or to visit the Food Bank Coalition of San Luis Obispo County's website. Munchkin March Photo Booth Photos are up! The Silent Auction: It's Incredible!